For the last 23 years, I preserved small to average sized crops because I grow much of my food on just 1/10th of an acre. Oh sure – occasionally, I would get a bumper crop of fruit from a friend, etc. But for the most part, I didn’t have mass amounts of fruit at any given time. All that changed 2 years ago. Now that my family is working to restore an old 14 acre-farmstead (with over 60 heirloom fruit trees), my style of canning has gone into overdrive. I still put up my small batches of produce from my own backyard. But when I am at the farmstead, I am doing large-scale canning. Which brings me to my new favorite tool – a steam juicer. I never felt I needed a steam juicer before because I considered them best for mass quantities of fruit. But after buying two (one for home and one for the farmstead), I now realize I should have bought one years ago. What is a Steam Juicer? 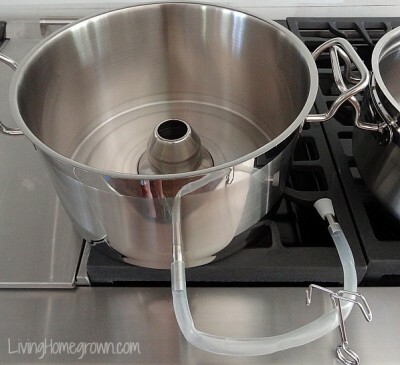 A steam juicer is a low-tech way to extract juice from fruit or veggies. It is simply a stack of nesting pots that sit on your stove. And it has a tube for pouring off the juice. 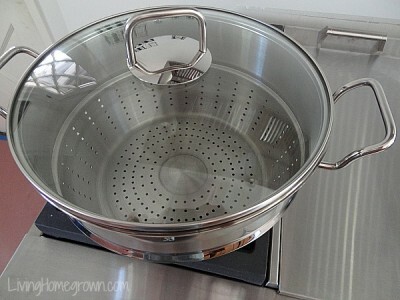 The top pot holds the fruit or vegetables in a colander so the steam can penetrate it. (Usually holds about 11 quarts) You just add the fruit (no need to peel or slice). 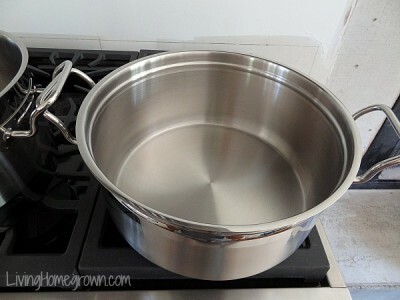 The bottom pot holds water and creates the steam. You just fill with water and keep it at a simmer to gentle boil. Larger Quantities: You can do quite a bit of produce at a time. But since it is so easy to use, I now pull it out for small batches as well. Very Little Prep: You do NOT need to peel, cut, pit or de-stem the produce. Just wash it and throw it on top. Clear Juice: The steam does an excellent job of extracting all the juice and producing a clear liquid free from most pulp. If you need to, you can easily strain it for super clear liquid. Relatively Fast: It is really relatively fast with low input on our part. It is certainly easier than cooking down the fruit and straining it through cheesecloth or a jelly bag. Concentrated: Due to the fact that you are only getting juice (little fiber) and you are steaming off some of the water, you get a very concentrated juice. Easy to Use: I use my juicer while I am in the kitchen doing other things such as making jam or baking. I fill it up with unpeeled fruit, turn on the flame and then just keep an eye on it for 45 min to an hour until it’s done. That’s it! The result is clear juice. I think a steam juicer is best used for making juice for jelly, but the possibilities are really endless. Some people use steam juicers to make clear juice for liqueur, cider or even wine. The finished juice is unsweetened and ready for anything. I freeze mine until I am ready to make jelly (or something else) later. It works great for making tomato juice. After the fruit is done and cooled, I give the leftovers to the chickens. Preserving in stages (like juicing and freezing for later) is really helpful. You may be wondering about why I would want a steam juicer instead of a mechanical juicer. It really depends upon what you need the juice for, how much produce you have to process and how much time you have. Extracts the juice by heating the cells until they burst. The juice trickles out leaving pulp behind. Produces a fairly clear liquid. Creates a more concentrated juice. Due to the fact that it is pure juice (with less fiber) and you are steaming off some of the water, you also get a very concentrated juice. Is not labor intensive. Although the steamer needs to be supervised, you are not actively doing anything but waiting. Extracts by breaking the cells through crushing or grinding the produce. Produces a less clear liquid with pulp. Offers more nutrition due to fiber and no heat. Requires you to actively process each piece of produce through the juicer. This is not an issue unless you are doing mass quantities. So Heated Juice is Less Nutritious? Yes – If you are going to drink the juice raw, you lose some of the health benefits with heat. The heat will destroy some of the vitamins and enzymes. So for the nutritional benefits of raw juice, a mechanical juicer is the way to go. But, if you are using the juice in a heated recipe (like jelly), it doesn’t matter. In that case, a steam juicer is easier and faster. The juice is very, very hot and you must be super careful when siphoning it off into jars. Wear oven mitts and watch for splatters. Or let it cool in the juicer a bit before removing it. Whenever you use a steam juicer, you need to keep an eye on the water level in the bottom section because you don’t want it to boil dry. But this is difficult when you are actively using it with heavy pots of fruit on top. To solve this problem, I keep a few glass marbles in the bottom pan. That way, when the water level gets low, the marbles start to rattle really loudly alerting me that more water needs to be added. You can get steam juicers all over the Internet or from a specialty cook store. (I got mine from Amazon because I have free Prime shipping.) They run anywhere from $50-$180 depending upon the type of metal they are (stainless vs. aluminum), their size and if they have a clear glass top or not. So tell me…Have you ever used a Steam Juicer? I love my steam juicer for plums, apples, grapes and tomatoes. The juice is great for holiday punches and mixed with carbonated drinks. The fruit juice is very sweet so I prefer to dilute it. The jars do get very hot when filling. I usually drain the juice into gallon size jars and redistribute into smaller containers. Also, I set up a skinny folding table in front of my stove to use when draining the juice so that I can use gravity to fill containers that are set on the table. 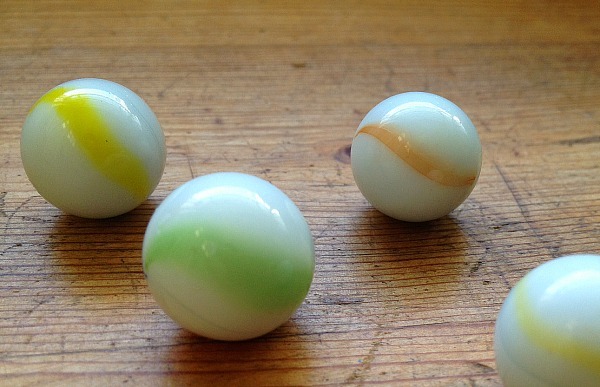 Thanks for the great tip on using marbles. I have only run it dry once but once was enough! This is very interesting. I hadn’t really looked into a steam juicer before because I didn’t really know they existed! It sounds pretty easy and a lot less labor intensive than the old method I have been using. Thanks for all the info. Before this, I was cooking the fruit and then straining overnight. That works, but this is much easier. 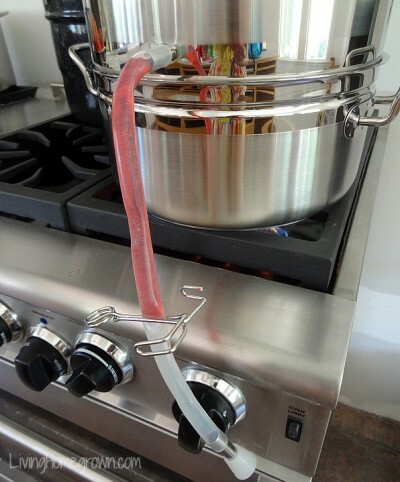 Would you siphon off the juice directly into canning jars and seal while hot??? When the juice is siphoned directly into canning jars and sealed do the jars still need to be put in boiling water for processing? We did the first step and the lids became secure, but we did not process the jars in boiling water. We left them on the counter. Now the juice has turned a darker colour. We are wondering if the juice is safe to drink. I’ve been using an older version of this for over 30 years and my own dear mother-in-love for as many years before me. It is a wonderful way to make jelly, with practically no effort as compared to the old way of cooking the fruit and straining. It’s the best for enjoying homemade fruit juices. The apple juice I’ve made is the best ever! I agree Karen. I wish I had used mine sooner on my smaller batches for jelly. Would have saved me a lot of strain time. The last time I steam juiced apples, I carefully spooned out the pulp (avoiding skins, stems and seeds) and spread it on fruit roll up dehydrator trays. Made the best fruit roll ups and much quicker as most of the juice is already extracted. I hate to waste anything. That is brilliant Debbie. Thank you. I will try that too! I have never heard of a steam juicer before and would like to buy one. You mentioned stainless steel vs. aluminum, is one better than the other? Many thanks. Some people don’t like to use aluminum because there has been much written about how it can leach into food and the health risks of that. Others say there is no proof of health risks. Here is post I read on it: http://www.takepart.com/article/2013/05/15/aluminum-pans-wont-give-you-alzheimers I will let you decide on that issue, but wanted you to be aware that is why some people prefer the stainless steel. I went for the stainless steel for 2 reasons: First, I wanted a heavy duty work horse since I knew I would be using it A LOT. I also wanted a heavy bottomed pan so that I had even heat for the long cooking times (an hour or more). And Second, I wanted something that would not react with whatever I was cooking. Some fruits are more acidic than others and you can get off flavors in aluminum. Since I wasn’t sure what I would be steaming, I went with the stainless steel. However, the stainless is much more expensive (closer to $100 and up). And if that had been out of my budget, I would not have hesitated to buy the aluminum. It is after all, only steaming the fruit. I purchased my Finnish steamer in 1976, and aluminum was the only option. Forty years of heavy use, and the middle juice pan has pitted from the high acidity (lots of tomatoes). It now has pin-sized holes in it. Quality stainless steel wouldn’t corrode. 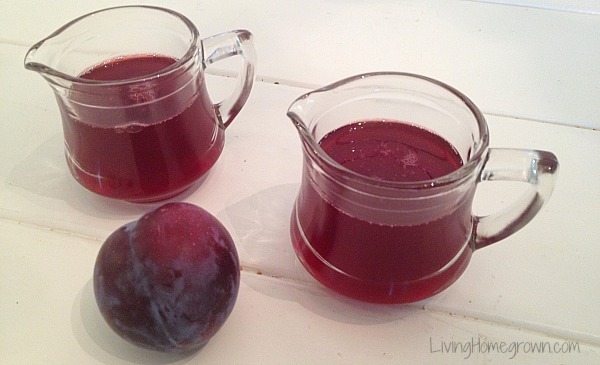 I have used my steam juicer for grapes, and a friend made some delicious cherry juice using this method. How does the apple juice turn out? With lots of apples to be harvested soon, I would love to try it for apple juice! Do you can the jars of apple juice? Thanks for the link, Theresa. Love your canning ideas since I am a beginner and need help. With all the apples that will be coming in, I also make vinegar…very easy to make. I also dehydrate apples and other fruits and vegetables. I love my juicer canner steamer! I bought mine about 6 years ago. I first used it to juice Elderberries. As the seeds can not be scraped. ( as in a juicer) It was a really great solution for juicing them. I also had huge amounts of peaches to process. (15 plus lugs fully ripe!) It was fantastic and simple. I had the juice and then put the peach pulp in the freezer and used it as I needed it to make baked goods. The only problem that I had was the little wire clamp on the tube. That problem was solved by a plastic clip for tube’s that I found in a Brew Store. It was a .98 cent solution as my hands did not have the strength to deal with the wire clamp. Also, a few years ago I bought some pure cranberry juice in a Health Food Store. It was $13.99 for a 8 oz. bottle. Now I just stock up at the holidays, put the cranberries in the freezer and when it is time to bring out the canning equipment I can process the cranberry juice as well. I have Blackberry Juice, Cranberry Juice, Elderberry Juice, and a mix of Cran/Elder. Also Grape, Peach, Apple, in the cupboard. One can save the dregs or feed them to the chickens, or compost. If the fruit still has flavor as some of my cranberries did I put them in a masson jar and covered them with vinegar to make a special dressing for the holiday season. 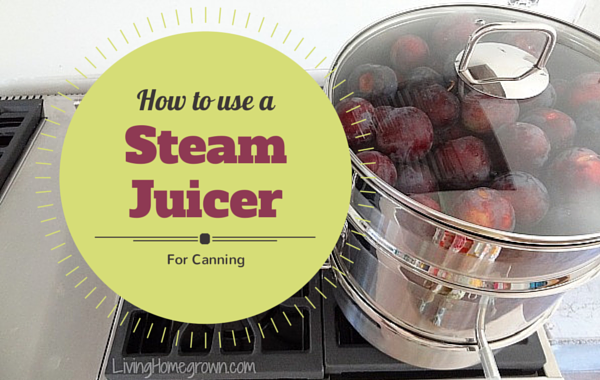 I love all the things I can do with my Juicer Canner Steamer! Oh I also have wildcrafted juice to make syrups for gifts. My list goes on and on. It is worth the money and they go on Sale in the fall. I could sure use one of these for my pomegranites! I love the jelly and it’s so labor intensive to extract juice from them. I have been steam juicing for about 4 years now. I really like ease of the process. However, I have found that the quantity of added water to the juice is substantial. It is not consistant, when I have weighed the fruit before steaming, and the post steaming residue, as well as the juice, there is an added amount of water of about 40%. Now, I try to limit the time the fruit is steaming and not get that last bit of juice out. But, I wish that I had more of a control over the whole process. I wind up boiling down the juice to make it more concentrated. Good point Donna. I never weighed before and after. I will have to try that. I’ve also noticed “diminishing returns” on juice when extracting for too long. I wish I could find some guidance on approximately how much juice to expect from a given amount of fruit. Part of the problem is that each fruit is different AND each batch can be different based on the water content and ripeness of the fruit. Here is a post I wrote on how those factors can affect your yield in canning. The same thing is true for steam juicing. Thanks for the informative link, Theresa. The problem I’m trying to solve is when to stop steaming a batch of fruit, to avoid adding a lot of excess water to the juice. (See Donna’s original comment, above.) For this, I just need a ball-park idea of how much juice to extract from a given volume or weight of fruit, before stopping the process. Any ideas? For my last batch of grape juice, I used a recipe (http://victorio.info/assets/vkp1140-juicer-manual-revision-june-2013.pdf) that suggests about 3-1/2 pounds per quart of juice. For 7 pounds of grapes, I measured the juice and stopped extracting after 2 quarts. I’m sure I could have extracted more, but I will use the juice for jelly, so I wanted a more intense flavor. I’ll let you know how it turns out. I have been using a steam juicer for several years now. It is indispensable for juicing things like blackberries, raspberries and elderberries. Their seeds are so small and pesky to deal with. Not anymore! In fact, I put all 3 fruits in at once and juice them all together. I call the resulting jelly ‘Briarpatch Jelly’ (OK, elderberries aren’t a briar fruit, but oh well.) I usually pick the berries and save them in the freezer until I have enough to juice at the end of the season. I find that the frozen fruit gives up far more juice than fresh. I just throw it all in frozen. Ta-DA! I put a bar stool in front of the stove and drain into HEATED gallon jars. Never dispense boiling-hot juice into cold jars. BAD. Very bad. Experience speaks, here. Enjoy your juicer. Thanks Terry. I did frozen plums and it worked like a charm! My Mother-in-law *loves* her steam juicer. She also uses the marbles and says it’s a real life-saver as she nearly ruined the pan a couple of times before finding out about that trick. I gave up on the clamp with my steam juicer years ago. It was just painful to use. I now use a clothespin. Works great! Good to know Diane. I will try the clothespin next time around. How much does the juice concentrate when extracted this way? I used mine to juice some elderberries to make wine. I had 10 pounds of fruit which most recipes indicate would make 3 gallons of wine but I ended up with almost a gallon of juice. Adding 2 gallons of water seems like it would dilute it too much unless the juice really is quite concentrated. I have heard others claim these juicer actually dilute the juice but I have only had this happen if you cook it for too long then you start getting extra water in the juice. I have heard both ways too. Some say it concentrates some say it dilutes and I think really the key is in how long you steam. It is hard for me to give an answer as to “how much” it concentrates as I feel it changes with every batch, fruit and the length of time steaming. I would say, you will have to judge each batch by tasting. I know that is vague. I hope that helps. The juice extracted will vary depending upon the fruit and the ripeness of that fruit. I can’t really give you a set amount. The juicier the fruit, the more juice you get. Sorry I can’t be more specific – but I have had a huge variance in what I get from different fruits and processing at different times in their ripeness. I have also found that freezing the fruit first gives me more juice in a shorter amount of time. I believe it is because the freezing breaks open the cells of the fruit and they more easily release the juice upon thawing. I am brand new to juicing and canning. My mother in law gave me her steam juicer. I am making juice from apples right now. I am not sure on when to say that there is no more juice going to come from the apples. LOL So care I have made 9 pints of apple juice. First batch was 6 pints and this second has made a little more than 3 pints because I wanted to taste it right out of the juicer when I let out my first opening. I am waiting to get more out now. When do I know it is done juicing? Thank you for your help. If you could email me back that would be great. I am using my cell phone and not a lot of service where I am at. I was traveling when this question came in so I am sorry I was not able to answer you right at that moment. The answer is that with a steam juicer there is no easy way to tell if all the juice has been extracted. Until you get to know that particular fruit and how it behaves for you, it is a bit of a guessing game. Sorry I don’t have an easier answer for you. 🙁 But what I would suggest in the future is that when you “think” the juice is extracted, pour it off and then continue to steam a bit longer and see if you get more or not. Wish I had a better answer for you. I hope your apple juice turned out well. We just got our steam juicer this year & love it! We steamed tomatoes. We canned the clear liquid & use it in the crock pot with roasts, as a veggie broth for soups & stews & even to cook pasta! We then took the pulp & ran it through our Victorio Strainer. (I’m not sure of that correct name since I received it from an old timer who had used it in her kitchen for years.) At any rate, the result was a very thick tomato sauce that we canned to it’s in all kinds of recipes. I can’t wait to try more recipes with our 2015 harvest! Thank you. I too have a victorio strainer and was wondering if I could use the “pulp” and re process it through my strainer. It seemed like such a waste to just toss the pulp away. I haven’t jet purchased a steam juicer;but it i will get one with in the next few days. Just doing some research first. Thank you so much. I wonder, if I wanted a jam instead of jelly, would it be possible to add some of the solid remnants of the juicer to the juice? Yes Bob, you could do that. But I think it might be easier to just make the jam straight out instead of separating the juice from the solids and then mixing them back together. Unless you were trying to create something that was not as clear as jelly, but also not as dense as jam? At any rate, yes…you can do that if you want to. I have found, over the many years of using my Mehu-Liisa (I’m on my second one), that I can get the steam going, let it boil for about 30 minuets then turn off the heat and let it sit while I go to work. When I come home I know I have gotten all the juice I’m going to get and I can then proceed with either making the jelly or bottling the juice for later. Excellent tip Gail – Thank you! I love my steam juicer! I’ve used it for chokecherries, and so easy ! I’m going to have to try the marbles, and the frozen berries. I have 4 gallons of frozen chokecherries, but thawed one out first and it just added an extra step it sounds like. I make syrup with it, delicious! Thanks for the tips! What do you do with chokecherry juice? I just got a steam juicer for Christmas last year and I am going to use it for tomatoes. What should I expect? I’ve never done this kind of juicing before! It works GREAT for tomatoes. Just wash your tomatoes, place on top and steam according to the instructions above. The riper the tomatoes the more juice you get from them. So green tomatoes don’t give a lot of juice. But ripened red ones do. Enjoy your juicer! Totally normal Stephanie! What you have is a super strained liquid of the tomatoes without pulp. If they are super ripe, you get more color. I use the juice for soups. But if you want more of a tomato sauce, you would need pulp in there. One way to get that would be to either next time puree the tomatoes (and freeze) rather than juice them. Or you can puree a whole tomato and add it to the juice you already have before freezing. I hope that helps! Thanks so much! I really appreciate your help! Theresa, Just found your blog. Love it so far. I have a question for the steamer. Since it leaves the skin and seeds behind, can I use it for elderberries and leave them in a clump, stems and all if I cut them as close to the clump as possible? I recently bought a steam juicer for all the grapes we have. I let the juicer drain it into a pot then transfer to the stove where I add a bit of sugar and bring to a boil. I then pour the juice into clean heated 1/2 gallon jars. Invert and it seals. I was not sure if it was necessary to process beyond that? Any insight would be appreciated! I used a steamer to make concord grape juice and jelly for canning. I decided to run the pulp through a strainer and freeze the resulting puree for baby food. Worked wonderfully. I never thought to do that before Shilo. I bet the puree tastes great. Yes it does. Great texture for baby food and full of antioxidants. You might want to check on the safety of feeding grape pulp to infants. Grapes have a lot of oxalic acid, which is why they are toxic to dogs. Oxalic acid may be concentrated in the pulp. A good place to start might be your local poison control center. I also adore my steam juicer…. Wild plums are in there as I type! If anyone has mentioned this then I’ve missed it, but I also like to use mine for bone broth. Add a turkey or chicken carcass to the basket with a splash of vinegar and let it steam. Any remainders of meat will come loose but also the marrow releases from the inner bones and comes right out the drain tube with everything else that has melted off! I have never done that Gina. Wow. thanks for the benefits of the steam juicer .can dry roselle be steam juiced? Find if you put chicken carcass in with onions, carrot and celery you get a great stock …….. This year I’m playing with making cider, this might be a simple first step saving the expense of scratters and presses …. Great steam juicer is the best. How about using it to make quince jelly. Anyone tried that out???? I have used it for Quince and it turned out beautiful. I LOVE the gorgeous pink color of quince juice – which I turn into jelly. Only thing is that quince can be rock hard and they are covered in a lot of fluff! You really need to wash them well and chop them into smaller pieces to put in the steam juicer otherwise it would take forever to extract any juice. What dilution of juice to water do you use? Pure concentrate is not a good jelly. trust me. it was awful. Medlars are ripe and well bletted, has anybody done Medlar Jelly? Also re previous comments how about making stock from beef, chicken, turkey will it just be a watery liquid or a more concentrated jus? When you steam juice peaches do you leave the pits in? I have been removing them beforehand but I was wondering what you do. I am new to steam juicing so every time saving tip helps. Thanks. I wander if you add sugar to the fruit juice before bottling. And in what proportion. Thanks. I have a juicer and prefer them for my soft fruits such as grapes, raspberries, etc. We last a huge branch of our lime tree last night, so today will be trying this on citrus (yet untested) and I am not sure how well it will work. I know the zest juice will be viable, but am not sure about the lime juice itself. Dang… I forgot. A trick that I use rather than marbles are two pennies. They also will start to rattle when the water gets low and steam forms underneath the pennies. Love the marble trick! I have never heard of that. Can’t wait to try. I have owned a norpro steam juicer for probably twenty years. I love it. However, when i fill the colander completely full of fruit, i find it takes four hours for all that fruit to look dried and spent. You are saying forty five minutes. Add you not filling the basket? I don’t understand why there is such a huge time difference. It may depend upon the fruit and the ripeness of the fruit. I fill the basket 3/4 full and I use fully ripe fruit. So maybe if I fully loaded it, it would take longer. Also, I sometimes juice frozen fruit. It takes longer to get defrosted, but once it starts going the juice comes out quickly. So you are correct that the time can vary. However, I don’t think I have ever gone 4 hours. Perhaps I stop too soon? 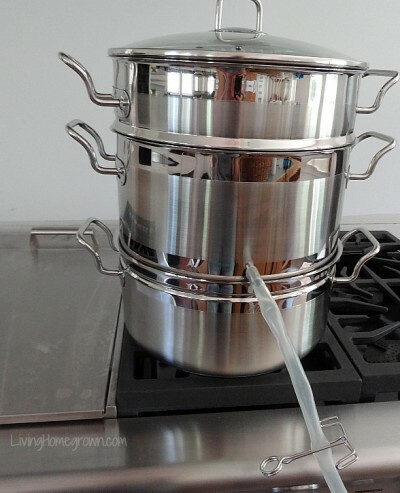 WIll this steamer work to distill water? I have an aluminiun steam juicer, now I would like to get one in stainless steel. I find a huge difference in price between different ststeel steam juicers. I cannot get them in Argentina. Will they ship me one from the USA, and if so, how long would it take to get here ? I love my steam juicer, I use it to make raspberry and eldelberry syrup to last all year, my grandchildren love it !! Would also like to have more ideas of how to use the new stainless steel steam juicer the day I get it. Thanks for the ideas! I’m totally going to try a meat and veg broth in mine tomorrow and then pressure can it! Is it necessary to do the boiling water bath at the end of the process when canning juice from a steam juicer? We have been using a steam juicer for many years, putting the juice in sterilized jars with heated lids, listening for the lids to pop, and we’ve never had any problems. However, after reading some websites, it seems like some people recommend a boiling water bath after the juice is in the jar. What’s your advice? I used my steam juicer on salal and Oregon grape and made excellent jelly that tastes somewhere between blueberry and elderberry. Delicious. I wonder if anyone has used their steam juicer for either hawthorn or barberry? I am, as you can tell, very interested in using wild berries, and now have access to an almost limitless quantities of hawthorn. I just did about 30 lbs of grapes. I borrowed a steam juicer from a friend. I’m not sold, though I may have steamed them too long. At least an hour for each batch. Definitely more diluted then I’d hoped. I haven’t canned it yet, I may cook it down a bit before I do. My strained juice was so flavorful and intense compared to this! Thank you so much for this post – was so helpful tackling this for the first time. These are my questions: When making apple/crabapple jelly do I add pectin since pectin is made from apples. I am having trouble getting this jelly to set. I have down the easy part on the pectin box of if you jelly doesn’t set but it still didn’t set. This is the first jelly that didn’t set. I have seen a post about making jam with the pulp left fro making jelly. When my children were home they did NOT eat lumpy jam. I made Jamly. mixed the pulp back with juice and it was wonderful . no waste!!! I ran the apples from my trees through a norpro apple master before putting them in the steam juicer. I got perfect juice and all the leftovers in the juicer went in a bowl with a bit of sugar and were whisked into applesauce in about 20 seconds. I’m really confused about how long to juice. I do elderberries for about 4 hrs then leave it to cool and about another pint accumulates. Also wondering if the heat effects the antioxidant quality of the juice. I’m not sure Pam – but I would imagine that yes, heat does reduce antioxidants. However, I do not know by how much. 4 hours is way too long to process elderberries if you are going to drink the juice or plan to make an immunity tonic out of it. I steam our elderberries no longer then 45 minutes tops. After that your quality is reduced and your antioxidant levels are way less. I’ve been using my Nutri-Steamer for about 6 years now. My main purpose for it is to juice all my wonderful Concord grapes. My juice always comes out so nice and clear…until the juice sits for a few days. Then it gets a bit cloudy like something suspends in it. I normally seal the steamed juice in hot sterile jars without processing in an open bath. I’ve tried both open bath and pressure but still get this same result. Doesn’t seam to affect the flavor but I really like the look of my jars when the juice is clear. Any tips on how to keep the clear juice from clouding? The cloudiness that comes after a day or two can be eliminated by waiting to bottle it until it gets a second run through the jelly bag (or as we call it at my house a pillowcase). Yes, it takes a bit longer, but I think it’s worth the extra effort. You get a commercial sized hug from this old greatgranddad. The marble trick is worth a million to worriers like me, like running out of water and burning up a good machine.Thanks, hon. I got a Cook N Home stainless Steel steam juicer and was so excited to use it. However, for grape juice, however it seemed to not let the steam in the hopper, all the steam would come out the sides. It took much, much longer than my old aluminum one. I was so frustrated I haven’t used it since. Do you know why it would do this, or what I was doing wrong? Thanks for a reply. I’m not sure Darcy. Perhaps the top is not sitting properly on the bottom pot? Maybe it is mis-shapened? There is a huge hole in the center where the steam should go. If it is all coming out the sides something is wrong. Only a small amount of steam should come out the sides. I’m not sure. I’m sorry! Darcy I’ve owned a couple Cook N Home SS steamer/juicers and have never had the 1st problem with either of them. Are you sure you’re using it correctly? We grow 14 varieties of fruits including grapes and all works well. Perhaps you should call the company and run it by them? Just a thought. I love the marble idea, the clothes pin idea. I make a lot of rhubarb juice my family loves it. I add fruit punch and ginger ale to make a punch for Christmas or pot lucks. This year I add some left over Saskatoons I had from last year the juice tastes great.